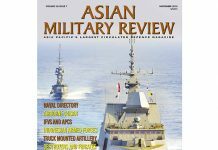 This is the September/October 2018 issue of Asian Military Review. This is not the latest issue. Sea Power: Shore-Based Training gives back days at Sea: Dr. Lee Willet finds out how shore based training in the Royal Australian Navy means more mission days on the ocean. 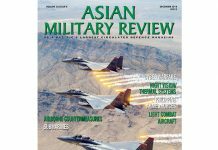 Air Power: Gunning for Trouble: Andrew Drwiega finds that the ‘big s tick’ attack helicopter is still an asset prized by nations Asia Pacific. 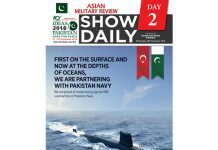 Sea Power: Anti-Ship Attack above and below the Waves: Tim Fish takes a look at the impact of the anti-ship missile (ASM) revolution. Land Warfare: Modern C5ISR demands greater Breadth and Depth: The challenges of wider than ever communications requirements, and the arrival of C5ISR, is examined by Peter Donaldson. Regional Militaries: Australia Recapitalises Defence Force: Australia is following the blueprint of its 2016 Defence White paper to make acquisitions that will reshape the Australian Defence Force. Andrew Drwiega reviews. 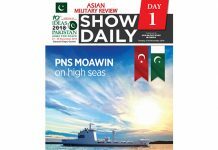 Sea Power: ASM Threat to ships countered by fast draw CWIS: Stephen W. Miller takes a look at the range and effectiveness of Close-In Weapons Systems. Russian Helicopters report: HIND, HAVOC and HALO just got better: Russian Helicopters invited AMR’s editor Andrew Drwiega to Russia to witness its recently modernised range of military rotorcraft. 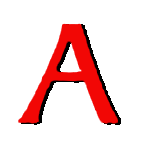 Analysts Column: Myanmar’s Army: New columnist Anthony Davis gives a sharp analysis of the Myanmar Army.